I've never really been a girly girl. Although, I have always loved getting dressed up for a rare occasion and I definitely love a good party. 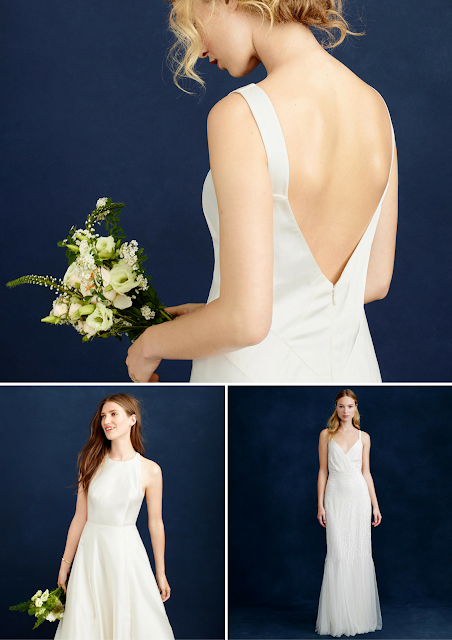 When it came time to start looking for my wedding dress I knew that I loved the simple and classic silhouettes and details of J Crew gowns. I remembered a beautiful column gown from a few years back and hoped that J Crew still made/carried it. Unfortunately, the dress had been discontinued. What's a girl to do in this situation? Sulk and move on to another dress? OR take to the resale market and find thee dress? I chose the latter option. There were a few listings in my size on both Tradesy and on Ebay. The dress on Tradesy had already been worn and the pictures were not quite good enough to see the condition. On Ebay there was a new with tags option in my size. I was a little unsure so I slept on it and ended up buying the new with tags version the next morning. I know that buying a dress online is not for everyone. It takes a lot of trust and letting go of the big "Say Yes to the Dress" moment in a bridal salon to buy your dress online. When it came in the mail I was just as excited to slip it on as I would have been in a boutique. I don't think that there's a scenario that would have made buying my dress less stressful or exciting for me. At the end of the day, do what's right for you.